What’s your biggest racing achievements to date? Placing 2nd overall in the World Enduro Championship 4 times. Where are you racing this season? 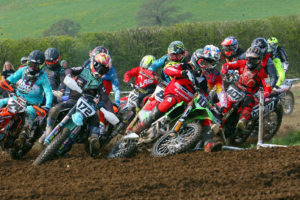 In the UK and Europe, British Enduro Championship, Acerbis Amateur Nationals MX, Scottish 6 Day Trial and other select enduros. Who is your biggest racing idol? Laia Sanz is really inspiring. She’s a good all rounder, and hold’s her own in the Dakar against the men! Who is your biggest on-track rival? Probably myself, I like to look at my test times and improve on them throughout the day and try to be consistent as possible. What’s your pre-race routine? I don’t really have one as such, but I always make sure to have a good breakfast and just double check my goggles are sorted. if it’s a race with a pit/service area, I make sure my toolbox and spares are out ready for if I need them and just have my own little area set up. Any superstitions? Not really, but I always hug my dad before I go to the line. Who has been your biggest inspiration? I’ve always watched my Dad and brother, Gary, and tried to copy what they do. Dad was into road racing when my brother started to show an interest in bikes and dad got him into Enduro. I watched for a couple of years and decided to have a try myself. At first I wanted to just get round and enjoy myself and then as I progressed I started to beat dad and then i’ve been trying to beat my brother ever since.